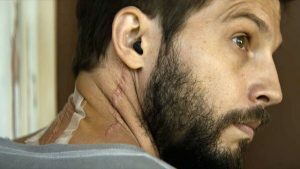 Directed by Leigh Whannell and starring Logan Marshall-Green, Upgrade is an action movie revolving around Grey, a mechanic played by Marshall-Green who, after getting paralyzed in the legs by the criminals who killed his wife, is offered and then given an implant containing an artificial intelligence program called STEM. It gives him the ability to walk, but also starts to help him track down those who killed his wife. He can also give STEM full control of his body, which lets him use his now enhanced body to fight the people he’s getting revenge against in more superhuman ways. DISCLAIMER: Upgrade is Rated R for strong violence, grisly images, and language. 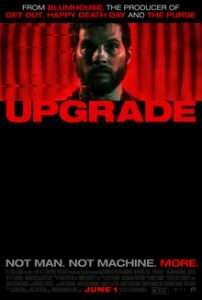 From the marketing, Upgrade seemed like a fun, passable action thriller with a cool perspective in the fight scenes, but turned out to be a lot more than that. I really did not expect to like Upgrade as much as I did. It’s fairly generic premise has been done many times before, but the spin it brings to that story is so much fun to watch unfold. The at times brutal action combined with the intense camerawork that throws you into the situation makes the action a major highlight, along with the main performance and the unpredictable plot. The movie is not without its mistakes, though, and many of the supporting characters are underdeveloped and the first 20 or so minutes occasionally stick out as expository. First off, this is a very unique movie. It takes a cliched premise and subverts that in very interesting ways. It takes a larger-than-life sci-fi movie and mashes it together with a revenge movie in a super cool way. The action here is also show-stopping. It’s shot in a very unique, point-of-view way that tracks the movement of Grey as he takes down bad guys. The sequences, because of a combination of the exhilarating choreography and the stunning direction, are incredibly fun. Logan Marshall-Green also brings a lot to these fight scenes. He shows a lot of expressions of horror and attempted restraint as STEM does brutal things to people through his body, and his facial expressions during the fight sequences make them feel more realistic. His performance otherwise is also pretty solid. The movie is entirely about him, and luckily, he carried the role and made his character sympathetic. Grey is an overall well-developed character and you learn enough backstory about him and he’s set up well enough that you feel invested in him throughout the movie. He makes the action sequences even more fun because his reaction often brings a lot of humor. Speaking of which, this movie is surprisingly pretty funny! It is not devoid of humor and the fact that he has a Jarvis-like AI inside of him allows for some well-timed jokes. The movie does get dark at times, but never really too dark. It’s also really, really violent. It gets a lot of reactions (including a few laughs because of this) out of the audience and there are some very unexpected moments of gore. There’s not too much that it becomes a distraction from the story, but it’s used at the right times for shock value that it leaves an impact on the rest of the action scenes. Another major plus with Upgrade is how unpredictable its plot is. Its base premise is already changed up because of the AI aspect, but the plot itself takes many very unexpected turns. It always goes the opposite of where you expect it to go until the very end. Its ending is built up properly from a series of twists and turns that leave you guessing what’s going to happen, but is also very thought provoking. It goes in a very intriguing direction that raises some questions as well as shocks the audience. While Grey is a well fleshed out character, none of the other characters really are. His wife that’s basically the driving force of the movie’s plot has no backstory or development, and we learn very little about her. The police officer character that’s also investigating Grey’s wife’s death and even the villains, whose motivations are brushed over in a quick scene, don’t get much to their characters besides their interactions with Grey. 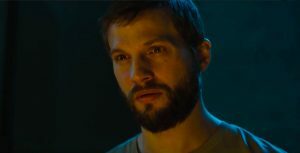 Upgrade runs at only 1 hour and 35 minutes, and while some of this may be due to how flat some of the characters are, it’s paced at really, really well at a breakneck speed that doesn’t ever slow down–that is, once it gets going. The first 20 minutes start off pretty slow, and can be very expository. While some background information is necessary from a movie that has the task of building and explaining its own world entirely, there are a few parts in the beginning that stuck out as being too exposition-heavy. 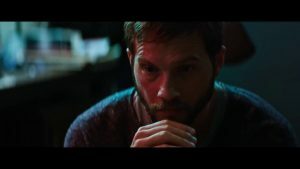 Upgrade definitely does an impressive job of getting us inside this world by the time the action kicks in, but the way it does so feels clunky at times. There’s some rough dialogue at the beginning that felt like it was almost talking to the audience, but it does effectively use other subtle strategies in other places to introduce us to the world. Overall, Upgrade is not only solidly entertaining, but very unpredictable too. 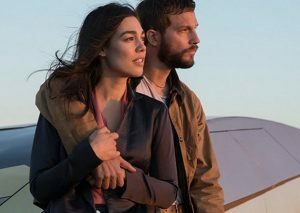 Logan Marshall-Green sells us on his character and is able to not only better the action sequences with his physical performance, but get us to empathize with his character. While the same can’t be said for the supporting chracters, the pacing in this movie is impeccable. Right as soon as Grey embarks on the journey to find those who killed his wife, the movie kicks into first-gear and constantly keeps us thrilled. Its action is almost resemblant of The Matrix in its choreography, but still manages to throw us into the fight with its awesome camera work. In conclusion, Upgrade was a very unexpected, enjoyable action thriller that I’m going to give an 8.4/10.